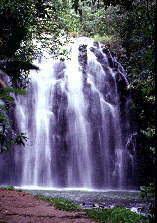 Possibly one of the best falls for swimming, with a lagoon style water basin that gradually moves from shallow to deeper. There is also a ledge behind the falls allowing swimmers to be immersed by the waterfall. Ellinjaa Falls are 3km drive past Zillie Falls. There is a grassed picnic area adjacent to the parking facilities. A viewing platform is located at the beginning of the walk (which descends to the waterfalls base), and provides a clear view for photo opportunities. The short walk down to the falls has steps to make the descent safer and easier.